My final score for Terra Cresta was 56100 that I set a couple days ago. I didn't really get a chance to play much today or I might have beaten it. My wifi isn't working now but I can post a pic in the morning to verify. Congratulations on another win @GrailUK It's been great to watch you do battle with the Japanese guy. I'm sure you're not finished yet,even though the challenge has. Are we just going to start the new challenge on the Ikaruga release day and let it run until until the 2nd Friday after? @Steveovig Well played and I'm glad you could join us. Hope you can take part in future challenges. I wasn't able to make time yesterday to try and better my score on Terra Cresta. I will be sure to go at it again for the open leaderboard. 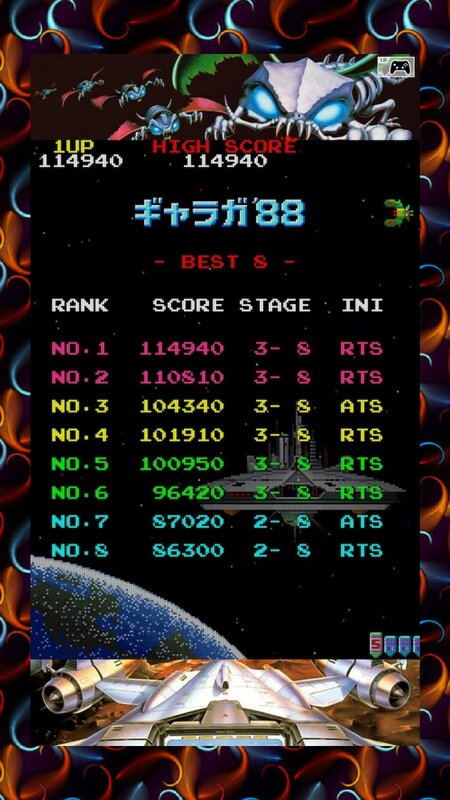 I was able to better my scores for the open leaderboard on Tengai,Strikers 1945,Dragon Blaze and Galaga 88.I'm sure I already posted my Galaga 88 score but here it is again anyway. @OorWullie Sounds good for Ikaruga. 1 credit/normal. And as for Terra Cresta...you are right. Ikaruga would be great for me! I'll have to divide my time between that and SF II. I'm sitting out IKARUGA. Been very lucky to buy or receive a lot of gaming related goodies over last few months. Most recent addition is a SNES Mini Classic, loving it! I reckon it's possible to tack another about 10k to my Terra Cresta score! 130K is definitely the ceiling. @Zkibu Well played mate. You beat me and @Agent721 in the end. @GrailUK Congratulations on a well deserved win. It was amazing to see you and the unknown Japanese person trade the top spot (and also leaving a huge gap to the number 3). @Corneel Thank you ^^ Every time I drop to second I start thinking I'm missing something lol. @masterLEON Damnit, I had no idea that you broke 30 million on Zen Pinball. Otherwise I would have played a bit more. Just checked on my Switch and noticed the tournament was already completed. @meppi64 Congrats to @MasterLeon Had forgotten when the Pinball FX Tourney closed. @Oorwullie Fancy creating another one for this week? 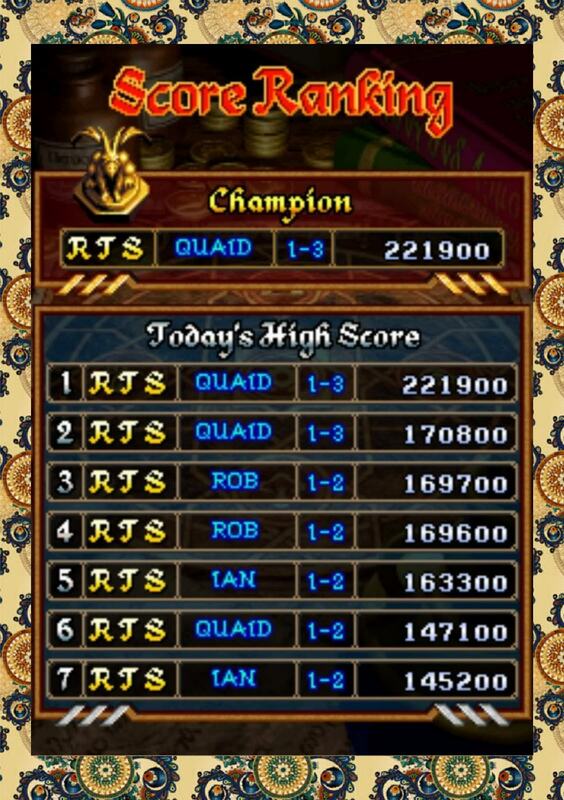 I've posted the final leaderboards for Terra Cresta and the Pinball tournament. For some reason it's only showing me 13 names on the leaderboard but 14 took part and it showed all 14 names the other day. I can't tell who is missing though? @Lroy I was going to ask about that. I'm not sure what tables everyone has. When the game launched 2 new tables were available for free ,Adventure Land and Son of Zeus. I assume many will have those and they're decent tables but not the best. For those who don't have them I couldn't recommend buying those before others just to take part in the tournament. Castlestorm is a really good table and fairly easy to learn ,that would be a great table for a tournament. It's part of a $5 two pack that also includes a Wild West table which is also pretty good. @Corneel Some nice score there. I was going to make the open leaderboard for those games single credit scores though. Really sorry ,I should have been clearer about that. I've been holding off making it up as there hasn't been enough single credit scores submitted. I can add a 2 credit open leaderboard too though underneath and include your scores on that. @OorWullie No problem at all. Single credit has my preference also, so that's fine. So let's see if we can get that single credit leaderboard going, especially now that we have a few days until Ikaruga. @OorWullie I've those three free tables. Happy to play a tournament on any of those. Obviously, others can express their interest or lack of it too. Capcom's Arcade back catalogue on Switch would be the most important E3 announcement ever for me personally. But that is dream land. @NinChocolate Mars Matrix would be lovely! I would just wish that we would get tons of shmups from those different companies which were known of making great one's, like Toaplan, Cave, Konami, Taito, Namco, Irem, Raizing etc. I have been trying/buying most of the one's which have come to switch and from that I have learned that I'm not too keen on the earlier ones like Terra Cresta (feel's strange, hard to see the bullets etc. ), Alpha Mission II or the newer Danmaku Unlimited style, which to me feels a bit too abstract. This far the Psikyo shooters have been the ones I enjoy the most, but not perfect as they are too difficult for casual play. I have Ikaruga on my XBone, but haven't really played it... I think I I will get it for switch too, but not sure if it's too close to the DM3 style for my liking.